In recognition with the Pulitzer Prize-winning author’s long and lauded career to be a master essayist, a landmark collection, including her most beloved pieces plus some rarely seen work, rigorously curated through the author herself. “A writer who never seems tired, who has never plodded her way by having a page or sentence, Dillard are only able to be enjoyed with a wide-awake reader,” warns Geoff Dyer as part of his introduction to this stellar collection. Carefully culled from her past work, The Abundance is quintessential Annie Dillard, delivered in their own fierce and undeniably singular voice, loaded with fascinating detail and metaphysical fact. The pieces within will exhilarate both admiring fans along with a new generation of readers, being “re-framed and re-hung,” with fresh editing and reordering with the author, to situate these now seminal works within her larger canon. The Abundance reminds us that Dillard’s type of “novelized nonfiction” pioneered the design long before it came into existence widely appreciated. Intense, vivid, and fearless, her work endows the and seemingly ordinary issues with life—a commuter chases snowball-throwing children through neighborhood streets, a young person memorizes Rimbaud’s poetry—with beauty and irony, inviting readers onto sweeping landscapes, to participate in her in going through the complexities of your time and death, having a sense of humor: using one page, an eagle falls from your sky which has a weasel attached with its throat; on another, a person walks right into a bar. 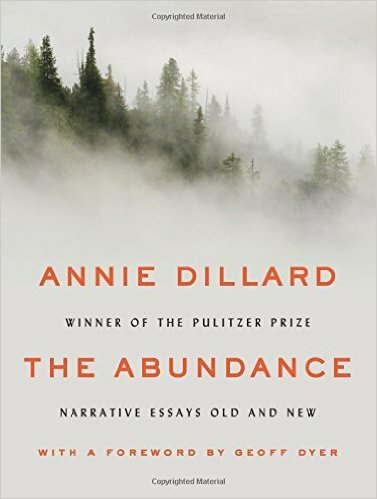 Reminding us in the indelible contributions with this formative determine contemporary nonfiction, The Abundance exquisitely showcases Annie Dillard’s enigmatic, enduring genius, as Dillard herself wishes so that it is marked. This entry was posted in Travel and tagged The Abundance: Narrative Essays Old and New.